Switzerland’s spectacular mountains & lakes, beautiful cities and fast-growing gay scene make it an amazing holiday destination. Look beyond the chocolate, cuckoo clocks and yodelling – contemporary Switzerland, land of four languages, is all about once-in-a-lifetime journeys, heart-racing Alpine pursuits and urban culture. Gay life in this old country is alive and vital and as fresh as other major European cities. Explore this special country with us! Geneva, a global city and centre of international diplomacy, is home to the scenic Lake Geneva and beautiful sightseeing attractions. Even if Geneva doesn't have big and sparkling gay life, its gay scene is definitely something worthy to remember. It's no wonder why it's included into the top cities to visit in Switzerland if you are a gay traveller. In Geneva, you will find several small bars and cafe with an original and stylish atmosphere while a gay-friendly attitude is prominent through the whole city. 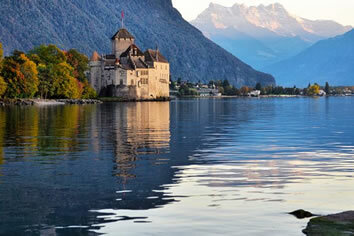 • Buffet Breakfast and enjoy a special excursion to Montreux from Geneva. • Explore the city with your LGBT Friendly Tour Guide. Stroll around the town of Montreux to see a glamorous tourist resort associated with the rock legend, Freddie Mercury. The statue of the famous British singer Freddie is situated in front of the lake. • Spend your enjoyable time by walking through the magnetic streets, having unforgettable promenade on the scenic shoreline of Montreux Riviera with inhaling the clear air. • The guided tour will proceed to discover the last point of the walking tour, which is the most visited medieval castle in Europe - Chateau de Chillon (entrance fee included). This castle is the main source of admiring this city. It is nestled on a rocky island, from where you will find out the importance of the historical heritage of Switzerland’s most visited place. Montreux is considered as one of the best places to visit in Switzerland, by offering a charming and peaceful atmosphere to its visitors from all around the world. • After exploring Montreux and lunch on your own, back to Geneva. • Dinner on your own and free night for party. Overnight in Geneva. • Buffet Breakfast and departure to Interlaken by Train. • Once arrived to Interlaken, accommodation at your hotel. Lunch on your own. • In the afternoon, enjoy a LGBT Friendly walking tour of Interlaken, the captivating "capital" of Switzerland's beautiful Bernese Oberland. Take a look to the Roman Catholic Church, near the prominent and historic Interlaken Castle. • Continue to Garden of Friendship, located on Höheweg Street next to the Hotel Interlaken, which is the first Japanese garden in Switzerland. It symbolizes friendly relationships between the cities of Interlaken and Otsu in Japan. • Then reach the famous Höheweg, the main street of the city, which stretches from the city’s central square to the east. This street is home to a huge number of fashionable hotels, restaurants, cafes, local shops, night venues, and is a touristic, shopping, and entertainment center. • Walk then till the Covered Bridge, a nice covered wooden bridge, which stands on a concrete foundation and provides wonderful views over the river and the surrounding landscape. Admire Swiss beauty and harmony. Once cross the bridge, welcome to Unterseen, found across the River Aare. In Unterseen are some lovely examples of lovely wooden buildings that exemplify the ‘typical’ Swiss chalet for many people but are usually only found out in the countryside. Also in this area you will find farmers that keep animals in their gardens. This area has a more historic feel to it than Interlaken and it isn’t touristy. • Overnight at your hotel in Interlaken. 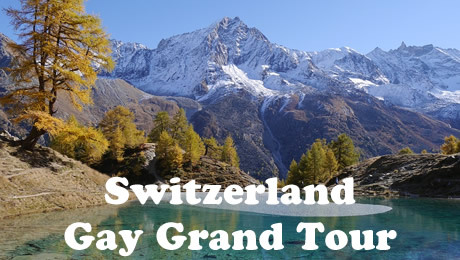 • Buffet Breakfast and be ready for an amazing excursion to the Jungfrau by private car/minibus and the cog wheel train that takes you to the top of Jungfraujoch the world’s highest railway station at 11333 ft.
• Experience the view from the biggest glacier in the Alps, the Aletsch Glacier and ice palace. • Afterwards back to Interlaken. • Spend the evening at leisure. Dinner on your own. 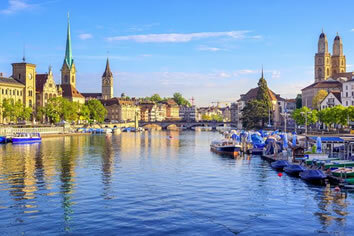 • Buffet Breakfast and transfer by private car or minibus to Lucerne. Arrival to Lucerne and accommodation at your hotel. • Then move on to Engelberg by coach for a fun filled day at Mt. Titlis. Your roundtrip ticket takes you from Engelberg to Mount Titlis by cable car. At 3020 m / 10,000 ft. the glacier paradise with the world famous ROTAIR - provides a 360 degree panoramic view of the snow covered valleys, glaciers, Black Forest region, lakes and mountains. • Lunch on your own. Back to Lucerne. 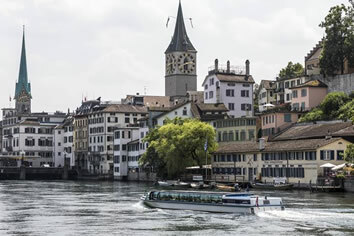 • Enjoy in the late afternoon a special LGBT friendly walking tour of Lucerne. Admire beautiful museums, theatres and festivals which make Lucerne a city of culture. Discover the city and the "Pink Panorama" which offers an insight into the LesBiGay cultural landscapes of the city. Admire the Chapel Bridge, the Water Tower, the Cultural Centre of Lucerne and the beautiful Jesuit Church. Our tour takes us past narrow alleyways, town squares and the city’s “crown” the Musegg Wall. 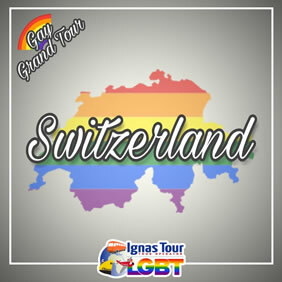 • After your LGBT Friendly Tour, enjoy a delicious Swiss Chocolate Tasting. • Dinner on your own. Overnight at your hotel in Lucerne. • Buffet Breakfast and departure to Bern by Train. Lunch on your own. • Once arrived in Bern, enjoy an amazing LGBT Friendly City Tour of the Swiss Capital City. • Start with the Bundeshaus, designed by the architect Hans Auer. Continue to the Bärenplatz (Bear Plaza), a square in the Old City which is part of the Innere Neustadt and of the UNESCO Cultural World Heritage Site. • Observe the Käfigturm is a medieval tower and Pfeiferbrunnen, a fountain located near Spitalgasse 21 in the Old City of Bern. • Your tour will reach then Zytglogge, the most famous medieval tower in Bern. • Dinner on your own. Overnight at your hotel in Bern. • Buffet Breakfast and departure to Zurich by Train. • Be ready for a special LGBT Friendly walking tour discovering the highlights of the Swiss city like Paradeplatz, which is one of the most expensive places in the world, observing the Fraumünster, more than just a church, the Thermengasse which marked the origins of Zurich city, St. Peter’s church and the Lindenhof, where you will enjoy a beautiful view point of the city. • Afterwards reach the Grossmünster where your tour will end. • Dinner in your own. Overnight at your hotel in Zurich. • Breakfast in the hotel and transfer to the Zurich airport. Just 80 m from Geneva’s Cornavin Train Station, this 3-star hotel is a 10-minute walk from the city centre and Lake Geneva. Free Wi-Fi is available in all rooms. All major city bus lines and the airport train leave from the nearby station. The UN headquarters can be reached in a 10-minute bus ride. All guests receive a free public transport card on arrival. The rooms at Hotel International & Terminus feature a minibar, a flat-screen satellite TV, and a bathroom with hairdryer. The Terminus Hotel features a 24-hour reception and a fitness room. The La Véranda restaurant serves Swiss, Italian, and international cuisine. Carlton Europe Hotel enjoys a central location on the Höheweg promenade, 100 m from the Interlaken Ost Train Station. It offers free WiFi access. In the pedestrian zone in the heart of Lucerne, right at the historic Kapellbrücke (Chapel Bridge), where the Reuss river leaves Lake Lucerne, you will find the lovely Hotel Des Alpes. Numerous restaurants, boutiques, souvenir shops, museums, impressive historic buildings, the train and boat station as well as the Culture and Convention Center (KKL) are all within easy walking distance of the Hotel Des Alpes. Enjoy superb views of the river from the terrace while tasting selected Swiss specialties and international cuisine. All guests receive a 10% discount in the restaurant. Spend peaceful nights in the entirely renovated, tastefully furnished rooms and start every new day at the rich complimentary breakfast buffet before you set out to explore the city. Set in the medieval Old Town, Kreuz Bern Modern City Hotel enjoys a central location in Bern, a 5-minute walk from the railway station. It features modern accommodation, the Bärenhöfli restaurant, as well as free fitness facilities and an infrared cabin. The Bear Plaza, the Zytgloggeturm clock tower and the Federal Palace of Switzerland can all be reached in 2 minutes on foot. Shops and restaurants are in the vicinity of Hotel Kreuz. A public parking garage is located a minute's walk away. Guests benefit from free public transport in Bern. All en-suite rooms are equipped with a flat-screen cable TV, a direct phone and a safe. The private bathroom is fitted with a shower or a bathtub and provided with a hairdryer. Free Wi-Fi is available. A rich breakfast is served each morning. Guests can also enjoy typical à-la-carte Bernese cuisine, lunch menus and light snacks. A selection of coffee, tea and fruit cocktails, as well as a variety of deserts and the famous Öpfuchüechli, are also offered.